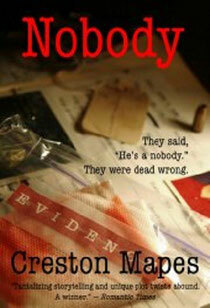 I finished reading Nobody, a novel by Creston Mapes in the wee hours of the morning. As I drifted to sleep I wondered what I might say in a review, pondered how I might narrow down everything going through my mind - everything I felt in my heart. Who was Chester Holte? What if I said he was a millionaire who decided to live among the homeless? What if I told you he gave up his home, job and even his church so that he could follow where God lead, even to the streets of Sin City, Las Vegas? Your eyebrows would raise as you tried to imagine not knowing where your next meal would come from, not knowing where you would sleep. You'd look around at your comfortable entrapments and shrug your head, knowing you couldn't imagine doing such a thing - and, unlike Chester Holte, chances are that you're far from being a millionaire. In many ways, Chester Holte reminded me of Jesus Christ. He had no consistent place to sleep but was loved by his friends and always came through for them. He comfortably talked about God, the forgiveness of sin and living a life while being redeemed, pointing people toward God. He drew attention to himself only when necessary, choosing instead to be humble. Chester even got angry on one occasion yet, in my opinion, didn't sin. Like Jesus Christ, Chester didn't turn people away. He looked for good in everyone, knowing each person was a creation of God. He gave his life for his friends - even unto his final breath. However, despite the parallels I've drawn between Jesus and Chester, Chester was quick to point out that he wasn't God - that he was merely a vessel God used to bring people to Himself. He didn't want people bowing down to worship him. There are many other characters in Creston Mapes' book titled, Nobody - a story told in a relaxed pace, despite the levels of tension evident throughout various parts of this story which revolved around Chester Holte. Chester was an integral part of each character's life - for good or ill - but there are few books I've read which have such a complete cast of characters. I read about police officers - both good and corrupt - as well as homeless people and those who dedicate their lives to helping them. I got to know one reporter fairly well and was introduced to my favorite kind of preacher - one who doesn't judge a person because of their past, instead accepting anyone from any walk of life as a way of introducing them to God's unconditional love, allowing God to work out the remaining details of their lives. Nobody kept me turning pages long into the night as I wondered and marvelled about the power and love of God, how He manifested Himself to others so they would follow their convictions and, essentially, give up the life they knew so they could really live. It's a great book for Christians everywhere. I wrote a review on Amazon as well. If you would like to read it, please click here. If you enjoy the review, please don't forget to vote for it as being helpful. Thanks to Creston Mapes, I will never again hear the word nobody and feel it's an empty, lifeless word - a word without meaning, without possibility - and I will definitely be reading other works by this author.